Home » Posts tagged with "breed"
Yorkies have hair, not fur. Unlike most dogs, Yorkies don’t shed because they have only a single layer of fine hair—like humans—instead of an undercoat. However, they lose their hair (which is usually silky in texture) naturally just as humans do while being bathed or brushed. In the children’s book The Wizard of Oz, the dog illustrated by W.W. Denslow was a Yorkie. However, Toto was played by a Cairn Terrier for the film. Yorkies can have floor length coats. The American Kennel Club’s “breed standard” maintains that the coat must be straight, down to the ground, and not “impede movement” of the dog while walking. Yorkies are in the toy group, but are actually terriers. The word “terrier” derives from the Latin “terra” meaning earth—no doubt due to this little dog’s ability to hunt small game. Yorkies are frequently used in cross-breeding. The most popular breeds include the Yorkiepoo (Yorkie and Poodle), the Morkie (Yorkie and Maltese), Chorkie (Chihuahua and Yorkie), and Corkie (Cocker Spaniel and Yorkie). Yorkies love squeaky toys. Maybe it’s because the squeakiness stirs up their age-old instinct to hunt and kill mice! In fact, Yorkies were once called “ratters” and used in mills to control the rodent population. In 1949, only 173 Yorkies were registered by the AKC. In 2007, they were the 6th most registered breed by the AKC. They can be suspicious of strangers. Because Yorkies fall into the terrier group, they are prone to bark at loud or strange noises, especially if it is a person they do not know. 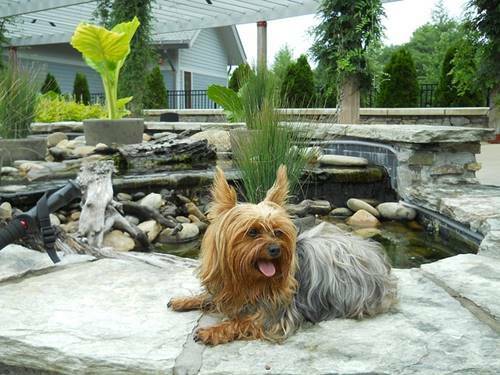 Yorkies consistently rank in the top 10 most popular breeds in the United States. Other popular breeds include Labrador Retriever, German Shepherds, Beagles, Bulldogs, Golden Retrievers, and Poodles. Yorkies should not be left outside unattended. Coyotes and even large birds of prey can easily take off with your small dog when you’re not looking—so better to be safe than sorry and always accompany your pooch while outdoors. The Yorksire Terrier was officially recognized by the AKC in 1885. The list of breed standard physical characteristics was last approved in 2007. There are 4 color combinations approved for the breed standard: Black & Tan, Black & Gold, Blue & Gold, and Blue & Tan. These 4 different combinations each have a specific code associated with them, and that number is entered on the dog’s registration form. A Yorkie has been a war hero! In World War II, an American soldier found a female Yorkie in a foxhole. He named her Smokey and she became one of the first ever therapy dogs, traveling all over the world entertaining soldiers with her antics. Even though she has since passed away, she has her own Facebook page. Yorkies can be litter-box trained! Though most owners prefer to let their pups use the great outdoors to relieve themselves, Yorkies have been successfully taught to take a page out of their arch-enemy’s book and use the litter box. Yorkies make great therapy dogs. Because of their portability and non-threatening size, Yorkies are great animals to take on visits to nursing homes and hospitals. And because they love to be lap dogs, they make great companions for shy children to practice their reading in front of. Yorkies are typically 4 inches long and weigh anywhere from 3.5-5.5 oz when born. 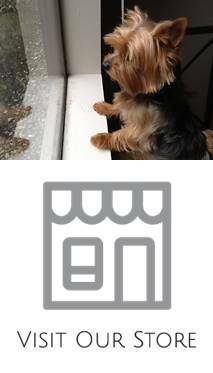 You can find size charts that will give you a rough estimate of the adult size of your Yorkie based on their birth weight. Over the years, different Yorkies have held titles with the Guinness Book of World Records for world’s smallest dog. The title is currently held by a Chihuahua living in Puerto Rico. On average, Yorkies only whelp 1-4 puppies. This is different from larger breed dogs, which can give birth to upwards of 9 to 12 puppies at a time. Like other toy breeds, Yorkies can be difficult to housetrain. To get the best start, try crate training and always praise your Yorkie when he eliminates outside. Because of their size, female Yorkies often require C-sections to whelp their puppies. This is a contributing factor as to why Yorkies are an expensive breed. There is no thing as a “teacup Yorkie”. Breeders often use this tagline to interest buyers, but the AKC only recognizes the Yorkshire Terrier, which should be between 4-7 lbs. Any Yorkie under 4 lbs will likely have severe medical problems. Like other dogs, a Yorkie’s sweat glands are in between his paws. This is why dogs pant when they become physically exerted and why it is very important for them not to become dehydrated. Even though Yorkies used to belong to the working class, several Hollywood celebrities are Yorkie lovers. The list includes Brett Favre, Britney Spears, Hilary Duff, and Audrey Hepburn. In September 2013, an event was held in New York City called “Yorkieday” which attempted to be the largest gathering of purebred Yorkies in the world. The event has contests for Yorkies including best costume and loudest bark. Yorkies seem unaware of their small size. Given their small stature, you may think Yorkies would be terrified of intruders or larger dogs. On the contrary, Yorkies are known for their strong sense of loyalty and face down opponents 10 times their size when they feel threatened. Yorkies are not the best choice in homes with small children. Because Yorkies are so small and have fragile bones, they do better in homes with older children and adults. Yorkies are small enough to fit under the seat in front you in an airplane. But be sure to check with your airline before heading to the airport with your 4-legged friend. There are many restrictions and fees associated with flying with your pup. Most Yorkies enjoy swimming. Although it’s a good idea to keep your tiny pup supervised whenever he is in the water. In addition to the conformation event, the AKC hosts 3 separate contests that Yorkies can compete in. They include agility, obedience, and free style. The latter of which involves dancing with your dog to a musical routine!